Place is good. Interenet is bad problem that I cant use on 4th floor. Where to find Athabasca hotels near an airport? Where can I find hotels in Athabasca that are near tourist attractions? Are you traveling through Central Alberta and are looking for accommodation options in the Athabasca area? Within a 0.1-kilometre (0.1-mile) radius of the center of town, there are 3 Expedia-listed accommodation options. Searching for accommodation within strolling distance of downtown Athabasca? 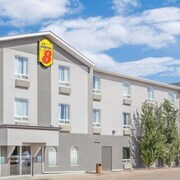 The Days Inn Athabasca and Super 8 Athabasca AB will fit the bill. If you are in the main part of Athabasca, it is 1 kilometre (1 mile) to the Athabasca Lodge Motel. Looking to venture a little further afield? Central Alberta offers many attractions. Central Alberta is marked by forests, rivers, streams and lakes. Commonly visited Central Alberta visitor destinations are old towns. Adventurous visitors can also try their hand at snowboarding and skiing here. Another place to spend the night is Westlock, which is 75 kilometres (47 miles) to the southwest of the heart of Athabasca. It is home to the Canadian Tractor Museum and the Westlock Golf Club. 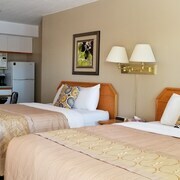 Westlock accommodations include the Ramada Westlock and Quality Inn and Suites. If you are traveling into or out of Edmonton International Airport and plan to stay nearby, try Best Western Plus Denham Inn & Suites or Ramada Edmonton International Airport. Are there hotels in other cities near Athabasca? What other types of accommodations are available in Athabasca? Explore Athabasca with Expedia.ca’s Travel Guides to find the best flights, cars, holiday packages and more!